Flipkart announced No Cost EMI in association with Bajaj Finserv in May 2016. 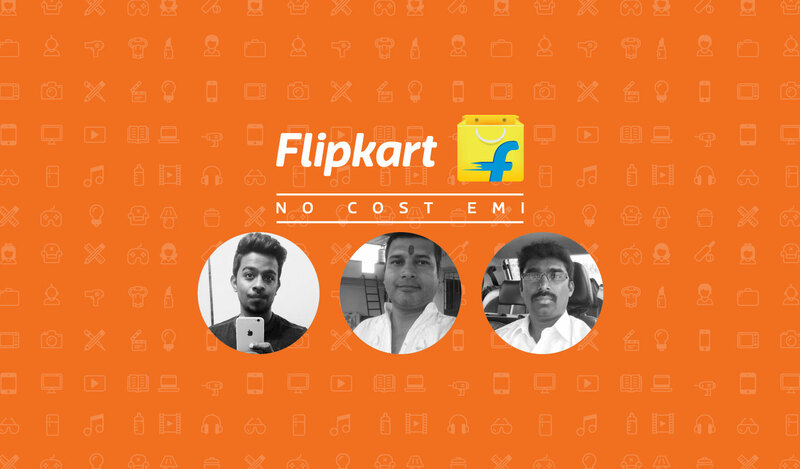 Three months down, Flipkart Stories spoke to customers who have availed of the facility. Here are their stories. In South Mumbai’s Pydhonie area, hand-drawn carts, narrow lanes with old structures and small businesses are a common sight. Every morning, Hafiz S Mansuri would make his way to this bustling locality to throw open the doors to his mobile retail business. He would spend his day selling customers their dream smartphones, but when it came to his own wish to own the latest iPhone, the dreams lost a bit of their sheen. The reason? “I was falling short of cash to pay for such a premium product,” he reveals. Sunil’s budget constraints are a common thread that most of us can identify with. Coimbatore resident A Punniaseelan also believes that planning is the first step to keeping his household’s monthly budget streamlined. This 28-year-old father of two carefully allocates money every month for essentials like food and clothes, in addition to his children’s education and co-curricular activities. But every time he considers buying his dream iPhone, a niggling worry of having overestimated his budget creeps into his mind. But wishes don’t come true just like that… or do they? For these four customers, and many others, something was to change their lives for the better. 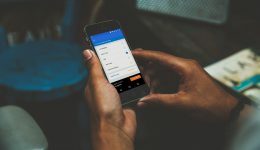 In May 2016, Flipkart launched No Cost EMI on the Bajaj Finserv card — an online payment option that would make it affordable to shop for high-value products on Flipkart. Flipkart customers could now skip the long wait and purchase their favorite products through EMIs with zero extra fees. An innovative online financing option, Flipkart No Cost EMI makes that big-ticket product on your wish list more affordable. How? By enabling you to buy premium products on Flipkart at no extra cost through EMI payments using your Bajaj Finserv EMI Card. Be it a high-end smartphone, a laptop or even a large smart TV, you can purchase your heart’s desire with zero processing fees, zero down payments and zero monthly interest. What’s more, you can also avail additional discounts through exchanges. Flipkart No Cost EMI is valid on some of the top brands and products in the country, including Apple, LG, Vu, Panasonic and InFocus. Short of ideas? Here are some of the fabulous high-end products you can buy using this payment option. Whether it is a family occasion, a wedding, a new house, or a change in your job that leads you down the path to buying expensive electronics, the thought of settling your credit or debit card bill afterwards is what makes you, like all of us, apprehensive. This is where opting for an EMI scheme helps. You can purchase a product and start using it immediately, but pay the price over an extended period of time in monthly installments of your choosing. Sure, it looks very attractive, but there is no such thing as a free lunch. Or is there? Apart from hefty interest costs, most credit card companies also charge a processing fee on EMI schemes. But with Flipkart No Cost EMI, you don’t need to pay a significant amount as down payment, processing fee and interest in order to check off your wish list. This is exactly what prompted us at Flipkart to launch this initiative — and our customers loved it! One, two… make your wishes come true! Indeed, there is nothing like the happiness you feel when your wish gets fulfilled — a fact that Sunil Kumar Prasad cheerfully agrees with. 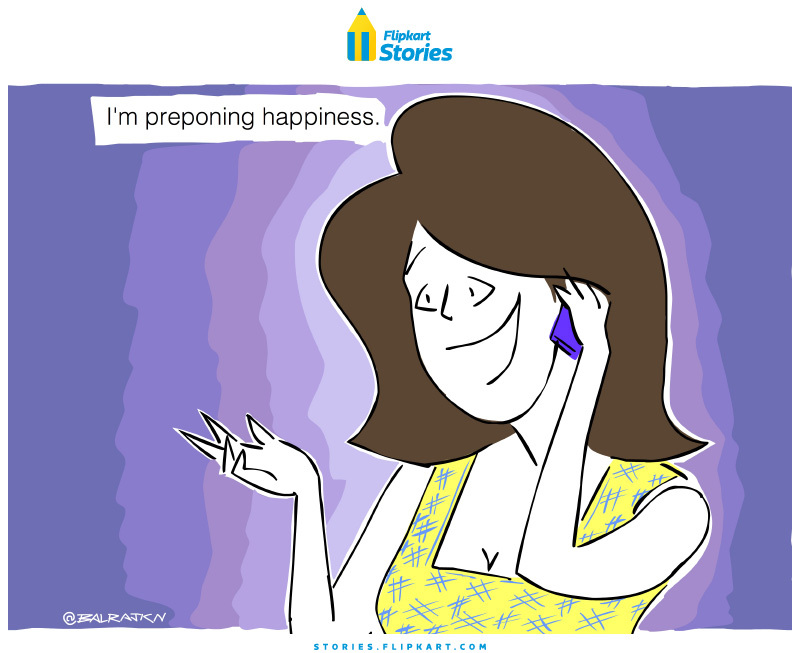 For Neeraj Vashist, every day begins on a joyful note when he sees his wife happily using her iPhone 6S. Previously, he had used his Bajaj Finserv card to purchase an air conditioner from a physical store, but this time around, he wanted to do something different. 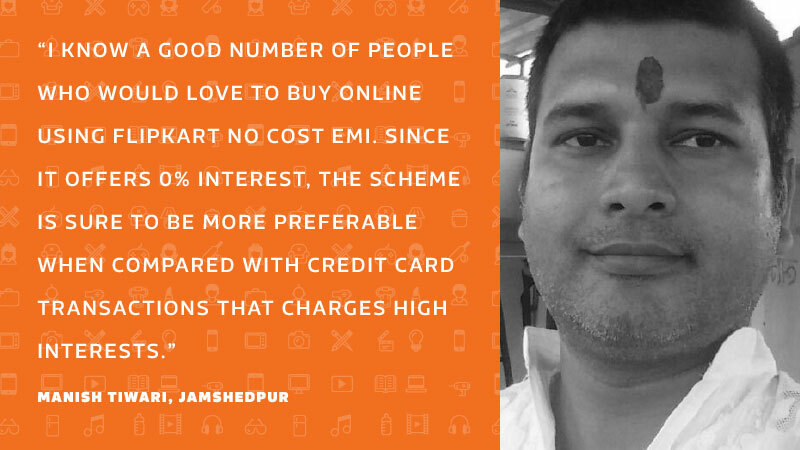 He says, “I had been searching for an online EMI option with zero monthly interest for the last three months when I came across Flipkart No Cost EMI.” Wish granted. On July 1, he placed an order for an iPhone with EMI tenure of 9 months. In Amritsar, Dilip Singh, an Assistant Front Office Manager at Hyatt Hotels, happily taps away on the new laptop he bought using Flipkart No Cost EMI. He had purchased products from Flipkart earlier too (including a mixer grinder), and came to know about the No Cost EMI facility through a notification on the mobile app. He then placed an order for a laptop using the scheme, which he says is “very user-friendly”. Though the laptop began to give him problems soon after delivery, he opted for a replacement. Since then, his new laptop has been working absolutely fine. 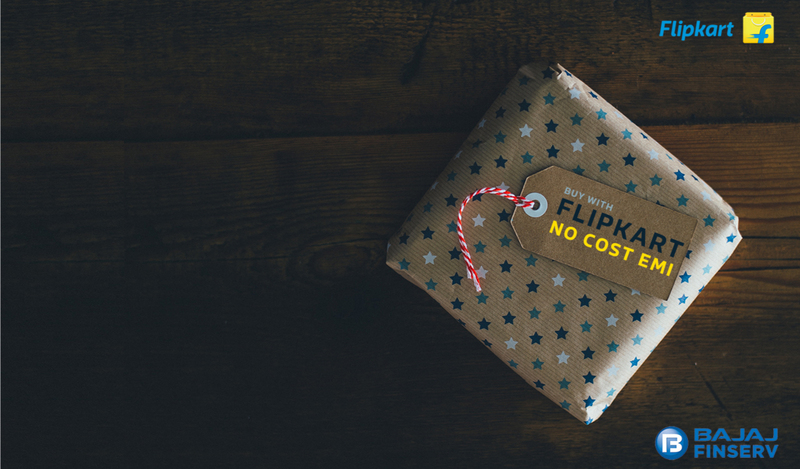 Flipkart No Cost EMI not only makes customers happier by helping them buy that big-ticket product, but also gives them the opportunity to display their expensive purchase. Think about the lasting impression you’ll leave on your peers with that expensive smartphone. And if it’s one as trendsetting as an iPhone, then one can only imagine all the extra attention that Jehu Makwana would be soaking up thanks to his new iPhone 6S. An engineering student from Baroli, Rajasthan, Jehu wanted to get his hands on the 6S from the day it was launched in India. 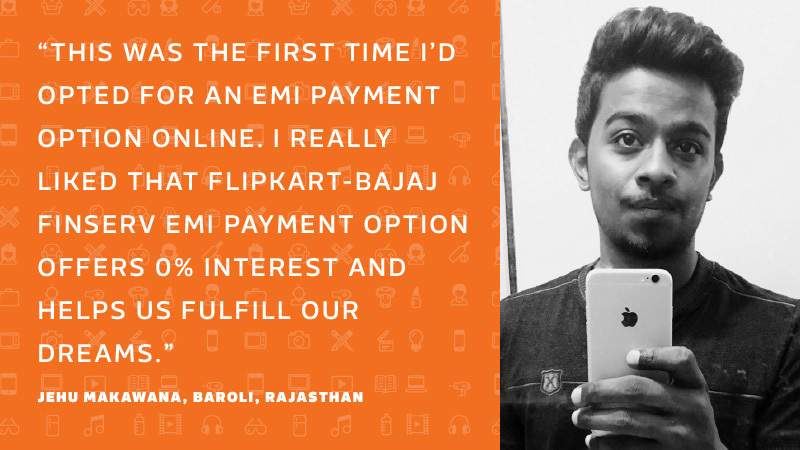 “The Flipkart-Bajaj Finserv EMI payment option with zero percent interest has helped me finally fulfill my dream of owning an iPhone. I have signed up for an EMI tenure of 12 months, and my parents are helping me pay for my new phone.” He tells us that he loves the image quality of his new iPhone in addition to its slow-motion video feature. Delighted customers spread the word… like wildfire! He loves Flipkart as a brand too, especially its endless variety of products, the MRPs that are lower than those prevailing in the market, the hassle-free delivery, and the easy exchange and return policies. 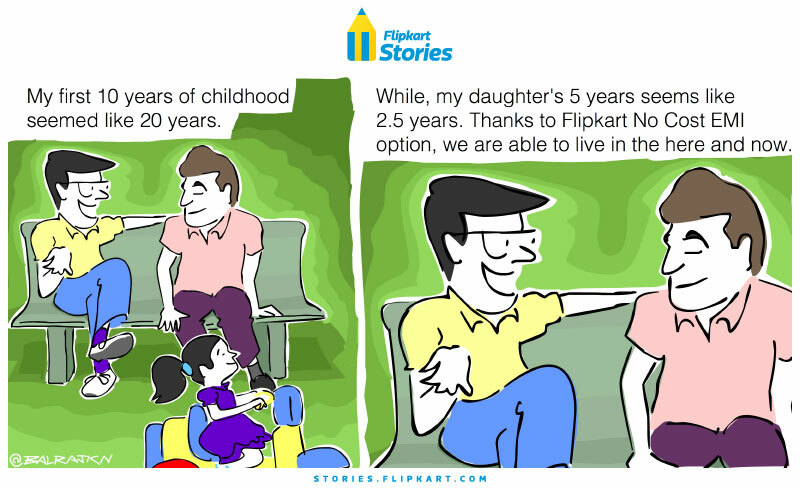 Rishi Acharya, too, is leaving no stone unturned in explaining the benefits of Flipkart’s No Cost EMI to near and dear ones. 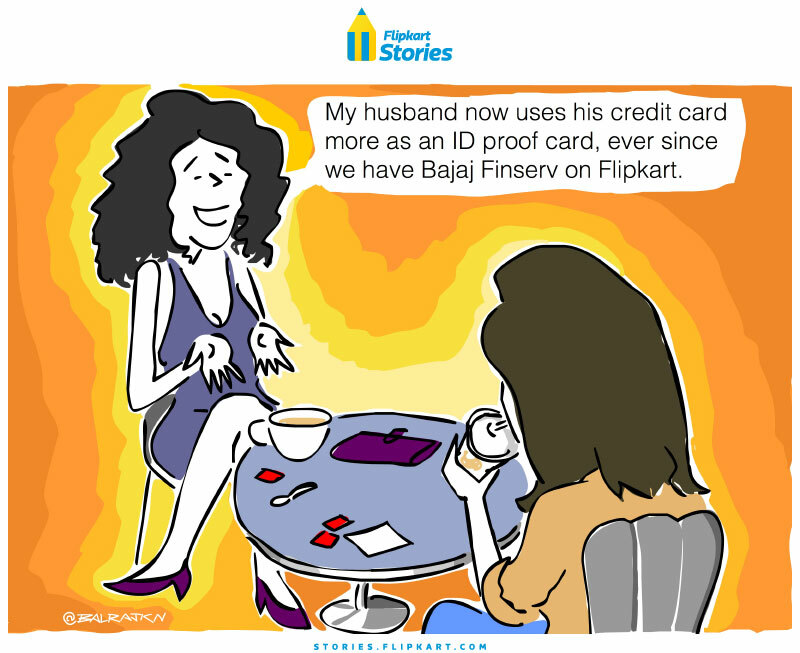 He’s even instructed those who have a Bajaj Finserv Card, including his sister, to always check whether Flipkart has in stock the product they are looking to purchase, and if yes, then whether the No Cost EMI scheme is applicable on it. So satisfied is he with the zero-cost feature of this scheme that he’s even planning to buy an Apple iPhone 6S in the future, but only after “paying off at least 2-3 installments” on his new laptop. Over the years, Flipkart has sought to fulfill customers’ wishes by enhancing the online shopping experience. From Cash-on-Delivery (CoD) to easy exchange and return policies, and most recently through the quality and speed assurance program Flipkart Assured, we has innovated to make the customer’s experience accessible, quick and affordable. Customer feedback helps us improve our product offerings and customer experience. While speaking to customers about their experience with Flipkart No Cost EMI, we made sure to enquire about their suggestions to improve the experience. We are listening intently to your feedback. 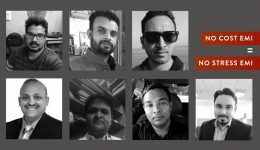 In some cases, we have responded with improvements and enhancements to the Flipkart No Cost EMI program even before you asked. 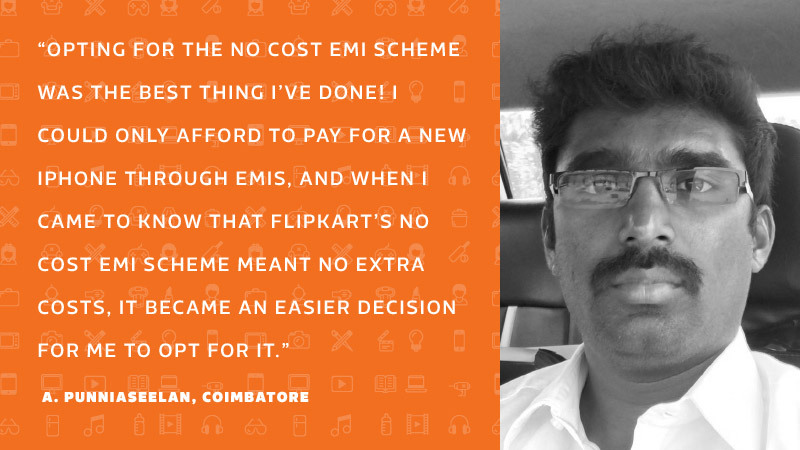 R S Gokul, who had requested that the Flipkart No Cost EMI scheme be available on both the Flipkart mobile app and the website, must have had his prayers answered when the facility was extended to customers shopping on the desktop site as well. Hafiz S Mansuri expressed his concern over the limited advantages that Flipkart No Cost EMI has for non-Bajaj EMI cardholders and said, “For such customers, Flipkart should try and launch an in-house credit facility, or initiate tie-ups with other credit lending organizations apart from Bajaj.” He must be satisfied now, for in August 2016 the Flipkart No Cost EMI was extended to credit card users. In addition to the over 7 million Bajaj Finserv EMI card-holders, more than 15 million credit card holders can now avail of EMIs at no interest, no down-payment and zero processing fee while shopping on the Flipkart platform. Two words to customers who’ve given us suggestions. Thank you! We really value your feedback and ideas, and have already started working on them. Inspired by these stories? Read this guide on Flipkart No Cost EMI, and get started right away.